In Ohio, the most efficient time of the year to plant a lawn, or renovate a lawn is in the Fall. At this time of the year most of us are about sick of mowing and all the other tasks involved with taking care of your yard, but this is the time of the year to prepare for next year! Seeding Ohio lawns is best done NOW! Typically between August 15th and September 15th is ideal. Why Now? Soil temperatures are starting to drop to ideal temperatures for turfgrass growth. If your lawn looks pretty good you can give it that extra boost by aerating and over seeding. 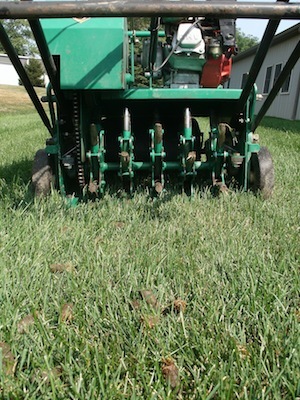 Aeration allows air to make it’s way to the roots as well as relieving compaction. Over seeding helps to create a dense lawn that will help crowd out weeds next year. Once seedlings have germinated, and been mowed twice, broad leaf herbicide applications are great for removing those unsightly perennial broadleaves. During the fall months, perennial plants begin to take carbohydrate reserves down to the roots. At this time they will also take herbicides down to the root, giving you more complete control.